If you want to build a trailer without tons of headaches, save some serious money, and have a trailer that is heavy duty, lasts forever, and can double as a hauler or box trailer, then this is for you. Gross Vehicle Weight (GVW): 3000 lbs. The price of this 43 page set of custom motorcycle trailer plans is just $69.95 $9.95. 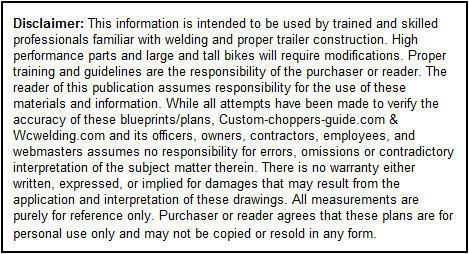 The bottom line is our 43 page set of motorcycle trailer plans are are simple, detailed, and easy to follow. The custom motorcycle trailer blueprints are made for a multipurpose trailer which could be used as a box trailer and a motorcycle carrier. The trailer is running on an AL-KO U 29 axle with rubber torsion elements and brake system. The GVW (gross vehicle weight) being 3000 lbs. The trailer should be fitted with a brake system. We are recommending an electrical brake system for this weight class. The manufactured parts for this custom motorcycle trailer are shown in the plans. If you want this trailer to look a little more custom you can modify it to satisfy your creative side. Make it match your custom bike! Think of this design as your template to work off of. Or, just ad killer rims to it. To make these plans easy to follow we kept it very simple and functional. Function is more important when it comes to tools and equipment, right? This 43 page set of motorcycle trailer plans is just $69.95 $9.95.